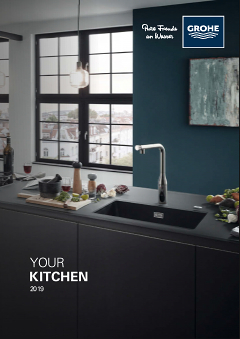 Elegant modern style meets premium performance with the Minta kitchen tap. With its high L-shaped spout that swivels through a full 360°, cleaning the sink or filling tall pots has never been easier. The tap's pull-down spray head adds to the operating radius for added cleaning convenience. With a lever that moves super smoothly thanks to the integrated GROHE SilkMove technology, the control of water volume and temperature is effortless and precise. Finished in our dazzling and scratch resistant GROHE StarLight chrome, it has a sparkle that will last for many years. With our easy installation system, you'll have it fitted in no time. A kitchen upgrade that makes an instant design statement and boosts convenience!